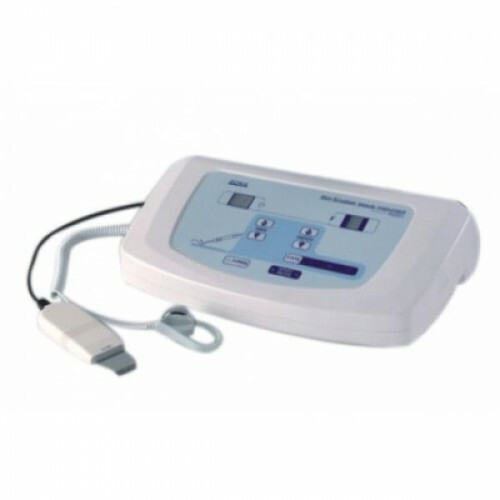 Ultrasonic H2201 can be used for skin peeling, micro-massage and phonophoresis. Ultrasonic peeling - cleansing facial skin using ultrasound. As a result, breaking of intermolecular bonds in the continuous field of ultrasonic waves of high intensity occurs effervescence (cavitation) applying a couplant to the skin, which causes degradation of desmosomes keratinized epidermal keratinocytes and exfoliation. In combination with the disruption of bonds in dense fibrous structures, and activation of metabolism of connective tissue such procedure stimulates the epidermal re-epithelization. Ultrafrnoforez - the combined effect on the body and the ultrasonic vibration input through them drugs. Due to the considerable pressure ultrasound (as high as 10 Pa) molecule drugs acquire greater mobility and move deeper into the tissues. Ultrasound causes increased permeability of the skin creates favorable conditions for the penetration of the drug molecules. By marked lipophilicity of surfactants quite easily diffuse in and pass through the interstitial pores of the endothelium of blood and lymph vessels. The amount of drugs that accumulate in the skin depot at Ultraphonophoresis less they act for a short time, which does not create a significant concentration in the affected area or pathological focus. The amount administered drugs in the body is 1-3% of the applied to the skin surface, and depends on the frequency of ultrasonic vibrations - the lower, the greater the amount of substance administered. Micro massage - high-frequency vibrations are transmitted to the tissue in contact with the radiator. Ultrasonic micro microvibration calls on a cellular level that allows you to shake the germination zone of the dermis and have a pronounced anti-aging effect. Procedure. For the procedure used mechanical vibrations frequency of 26 kHz 0,1 generated in the selected mode. As the radiator using special flat spatula with a bent tip. Sharpened spatula produce peeling, and opposite the flat back - phonophoresis and micromassage. The procedure is carried out by continuously moving the transducer over the skin moistened with a special liquid (medium contact). As a result of going on a powerful moisturizing skin and seal the fibers of the dermis (lift). For realization of cosmetic procedures described above, the device generates ultrasonic vibration in three modes. - Generate continuous mode ultrasound stimulates cellular processes, enhancing the regeneration of skin cells, increasing the synthesis of collagen, elastin and hyaluronic acid, which are responsible for the strength and elasticity of the skin. This mode is used for massage and ultrofonoforeza. - Pulse mode ultrasound is punctuated by lymphatic drainage effect, helps relieve swelling, removal of toxins and metabolic products from the cells. - Mode Variable generation of ultrasound helps to restore facial contours, as well as struggling with stretch marks, adhesions, post-acne scars.